I received one of your packages today. I really appreciate your efforts to provide some cheer and thoughts of home. For those of us stationed in Iraq, things are much better than they used to be as the Iraqis are taking much more control of their own security. However, for those of us away from family that we care about for extended time, your packages and especially the notes inside are a welcome diversion. If the opportunity arises, tell Kayla - Clear Springs HS, Maritza Rosales, America Sandoval and Kathleen Burns that I am grateful for their time and effort to write those notes. I received a couple of days ago, the packages you sent me. I thank you from the bottom of my heart, as does my little team that I'm working with. I greatly appreciate you taking the time, energy, resources, and effort to put together so many good things and send them this way. It means a lot to us to know that folks back home remember us and share their goodness with us. Thank you very much! Please pass along our thanks to the youngsters that made the cards: Afton, Andrea Lloyd, Abigayle, Gabbie, and Allison Boyd. We are grateful for those rays of sunshine. Another coincidence -- one of my Soldiers is married to a gal that works for NASA. He's one of my special Soldiers that always seems to have a witty comment readily available or at least a way of making people laugh. Anyway, his wife is a real "headsy" lady -- guess you kind of have to be in order to get recruited to work for NASA. I sure do miss home -- didn't really notice it too much when we were back in Hawaii (go figure, eh? ), but how can you ever truly get comfortable without a Whataburger around the corner? I was gutted that TCU failed to show up for their bowl game, but am encouraged by how well the Cowboys have done lately. Your HOME organization is providing an outstanding service in support of our guys. It may sound cliche, but nothing is as pure as the heart of a volunteer -- it demonstrates exceptional character to give so freely without any promise of reward or acknowledgment. None of what we do is possible without y'alls support. On behalf of my Soldiers, please share my thanks and appreciation with your entire team! Hope you all had very happy holidays. Things over here are going as well as can be expected. Things are starting to slow down a little, its getting to cold for the bad guys to come out and play. 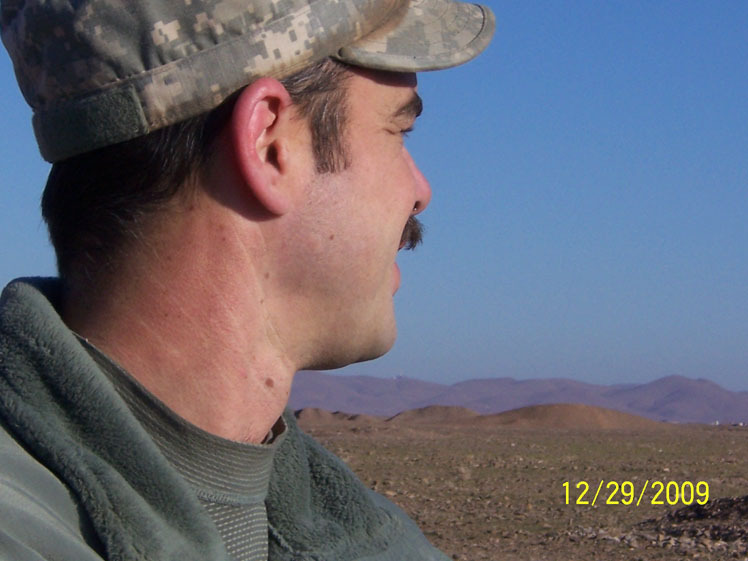 I have been living in western Afghanistan, about 28 miles from the Iranian boarder. There aren't many of us here, we started with 12 a few months ago and are finally up to 28. I'll try to write more later. 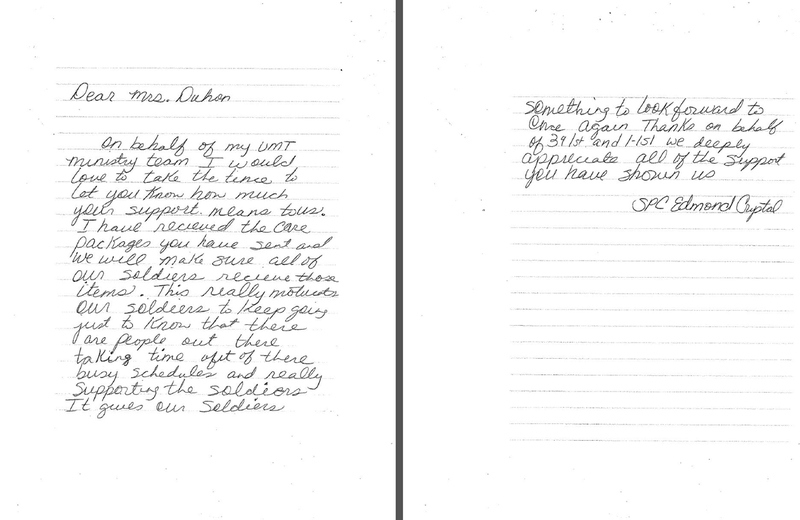 Letter from MAJ Dan Berason. Click image to view larger. Letter from Etim Ekere. Click image to view larger. 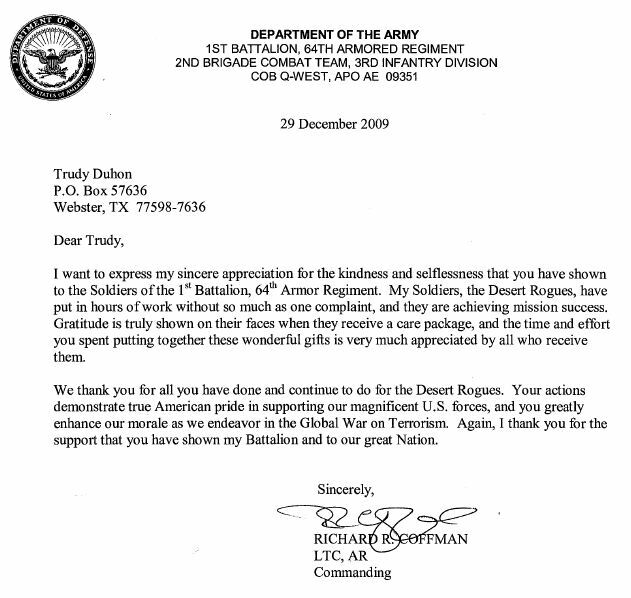 Letter from LTC Richard Coffman. Click image to view larger. 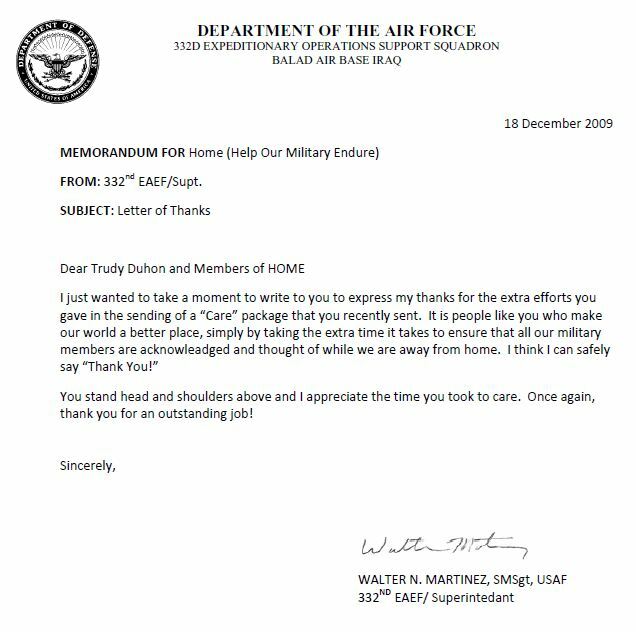 Letter from SMSgt Walter Martinez. Click image to view larger. Happy new year! 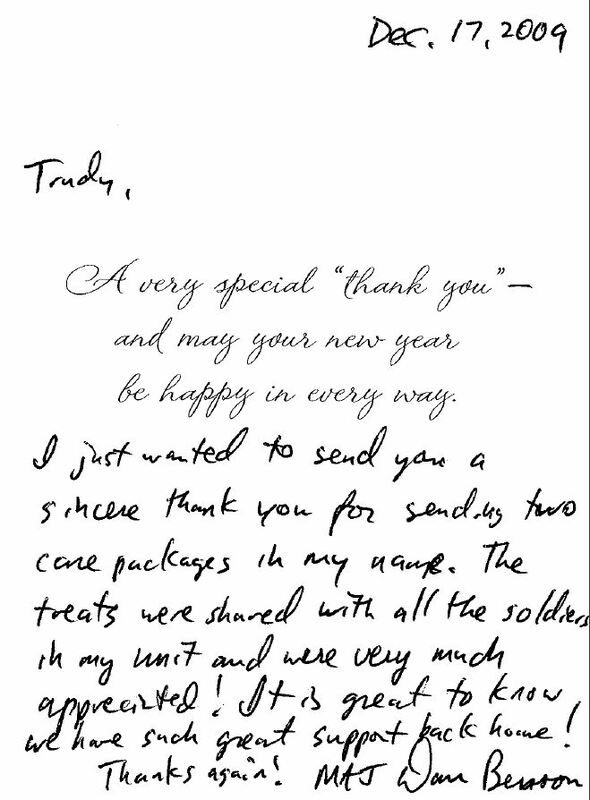 I wanted to take a minute to thank you for the wonderful care package you sent to me recently. 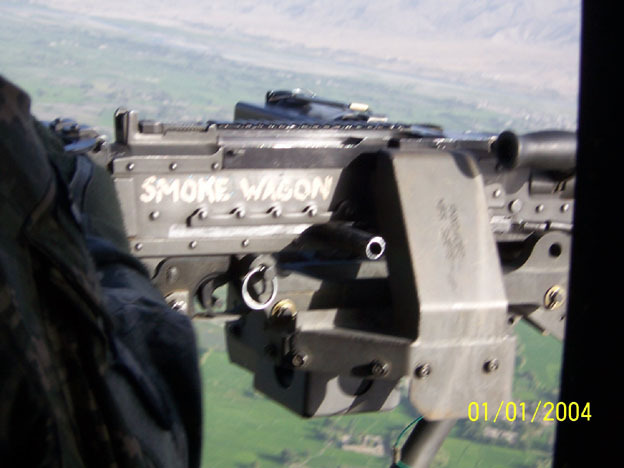 I also want to thank you for your sponsorship of an organization dedicated to helping those of us away from home endure. Endure is an appropriate word for the mission here. 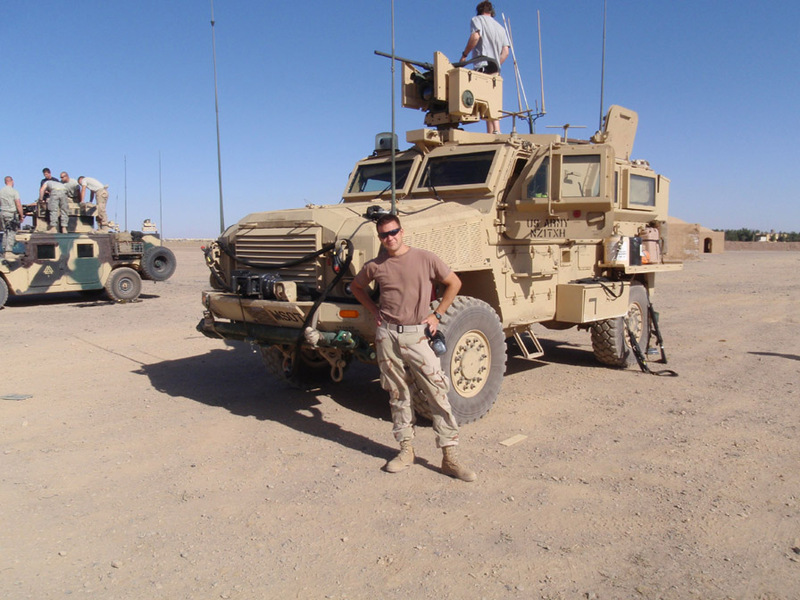 I am a Company Commander for a Military Intelligence Company, Colorado National Guard. Between the training to get us here and the time it will take to get us all home, it's about an 18 month process. Long time to be away from family. Your act of kindness did not go unnoticed. In fact, it will touch more than just me as I put it all out in a Common area for the Soldiers to partake of as they are in the Company HQs area. 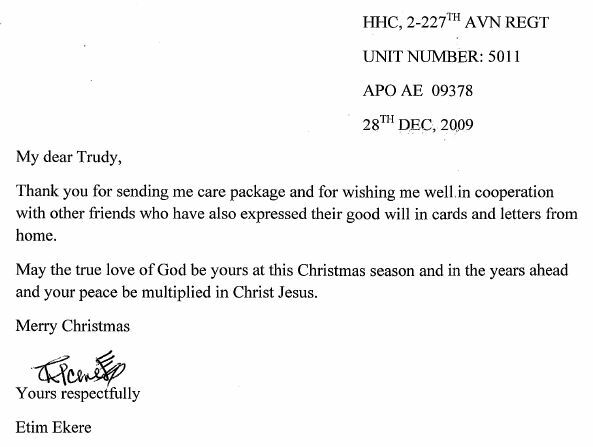 Letter from SPC Edmond Crystal. Click image to view larger.